When in Stara Zagora, we are always looking for something. 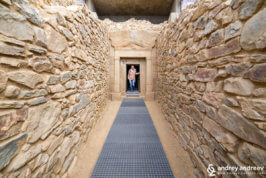 Sometimes we look for attractions, other times just for a company, and recently we most often search good restaurants. Not just good, but really good restaurants. The beautiful and warm city of Stara Zagora is our favourite place to spend the weekends, wandering through its straight streets. 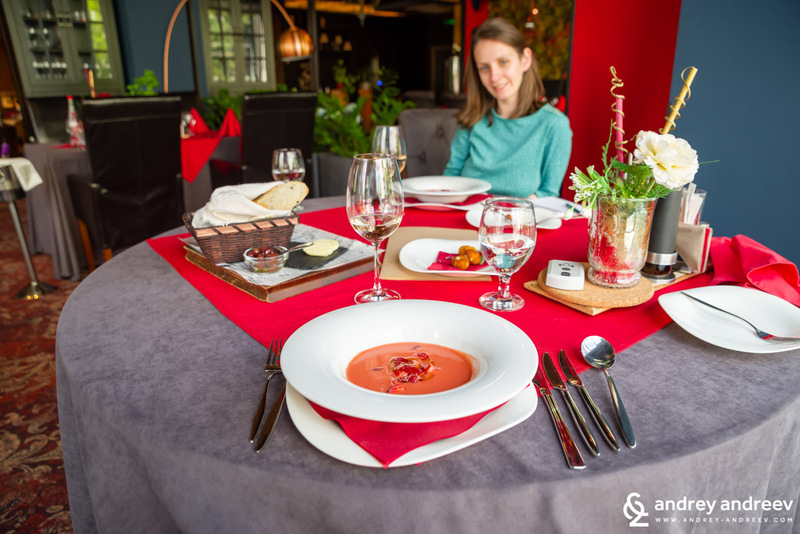 So one spring Sunday, when there was a marathon in the city and almost no cars on the streets, we headed for a long lunch in a restaurant in Stara Zagora, which was still new for us. 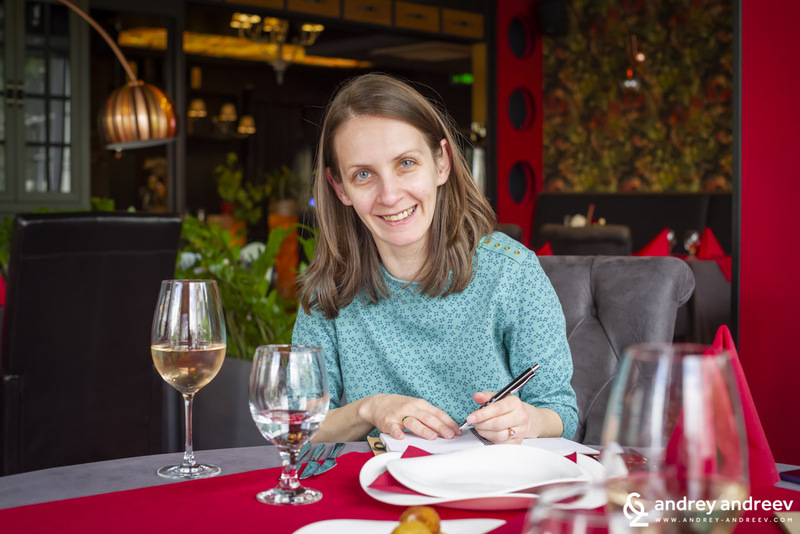 We had secured a 7-course (or maybe more) lunch and we were eager to see how they would surprise us. We met chef Tsvetan Stoyanov at the end of the lunch, just before he personally served us mint tea for a refreshing finale. He had planned all the program for this amazing culinary trip. And we only knew that the chef becomes really enthusiastic when cooking for people that can appreciate good food. And we are exactly this kind of guests and that day we were in the perfect mood to enjoy good food. Where is this restaurant? 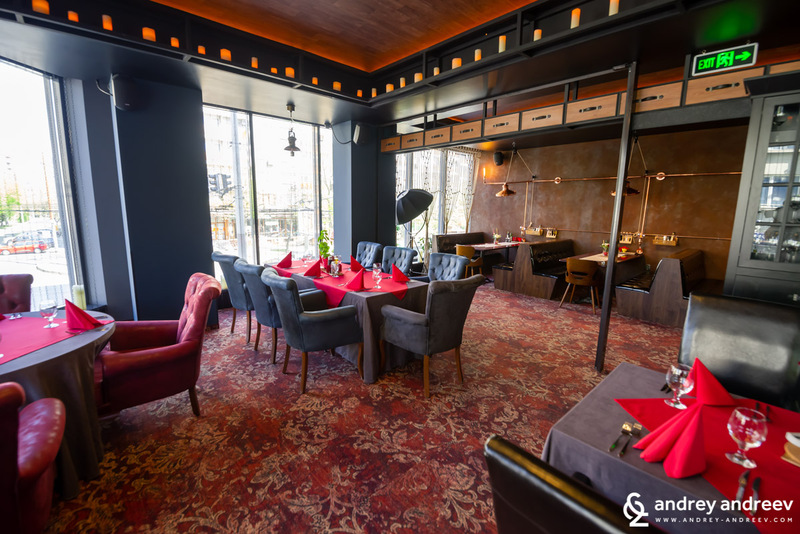 The restaurant is in the city of Stara Zagora, just on the corner of the streets General Gurko and St. Patriarch Evtimy in the building of the new 4-star Best Boutique Hotel. 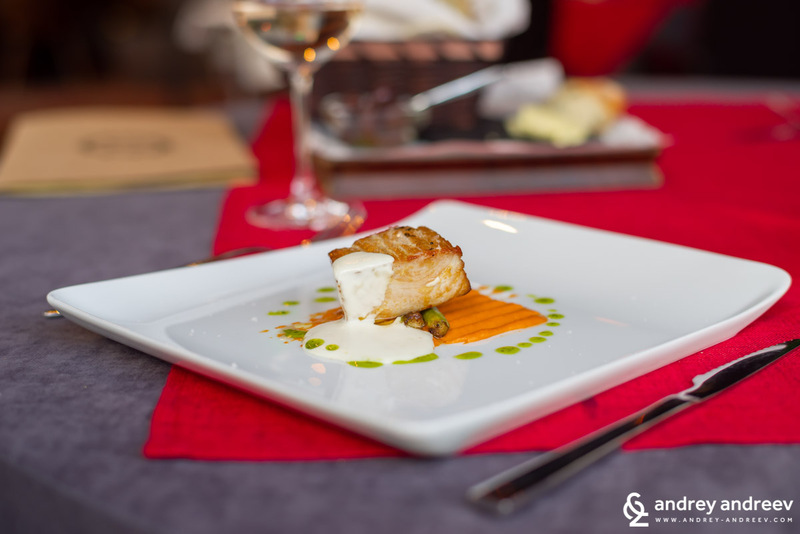 This day we do not need to know the menu, because our lunch is entirely in the hands and mood of chef Stoyanov. 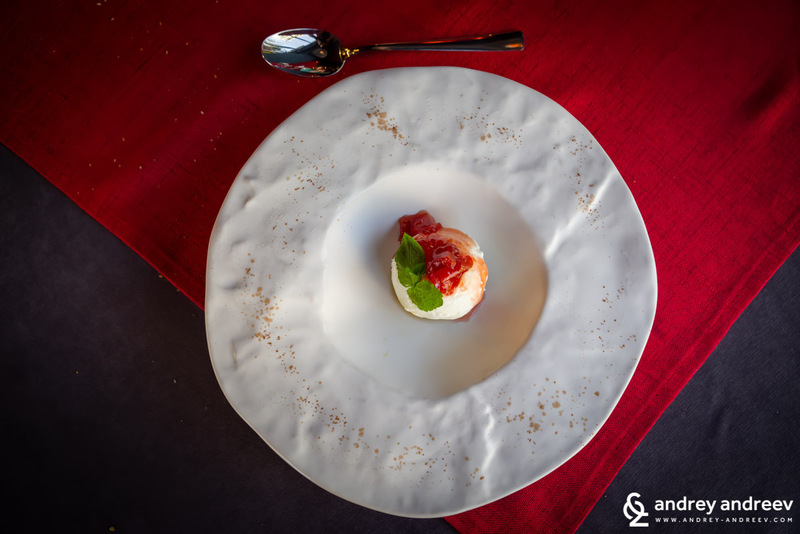 We love to organize such special culinary experiences and when the chef is enthusiastic like us, the final result is just amazing. 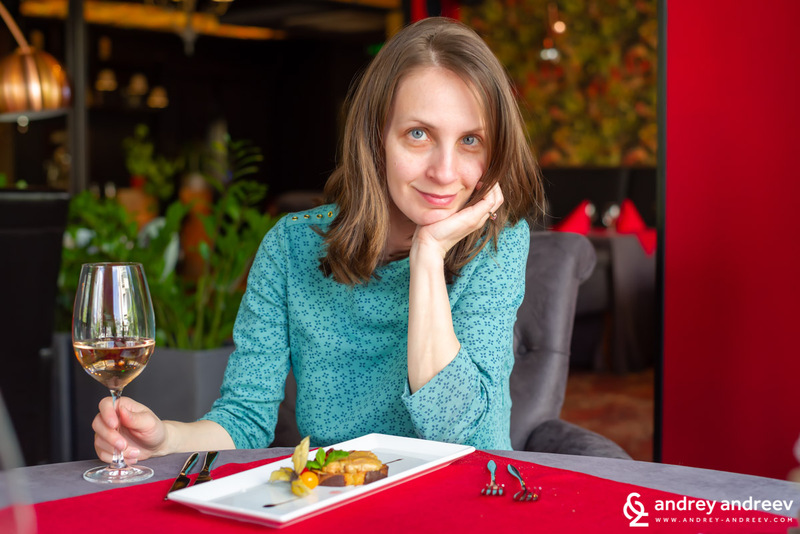 If you go there and read the menu, you probably won’t find the exact dishes we tried, but you will find the same chef, ready to share the pleasure of food with you, too. Of course, you can also arrange a tasting menu, but mind that you should book in advance. We started with the wine list, which, despite not too long, included the right wine for our lunch. We picked a Bulgarian rose wine from 100 % grenache. However, wine was not the main accent this day and after the first sips we started waiting for the food. Meanwhile, we enjoyed the view to the city through the window (the restaurant is on the second floor), where runners were still competing on the streets. Maria wisely started to take notes and I god ready for the coming culinary adventure. We had prepared for a tasting lunch and this was the only information we had. 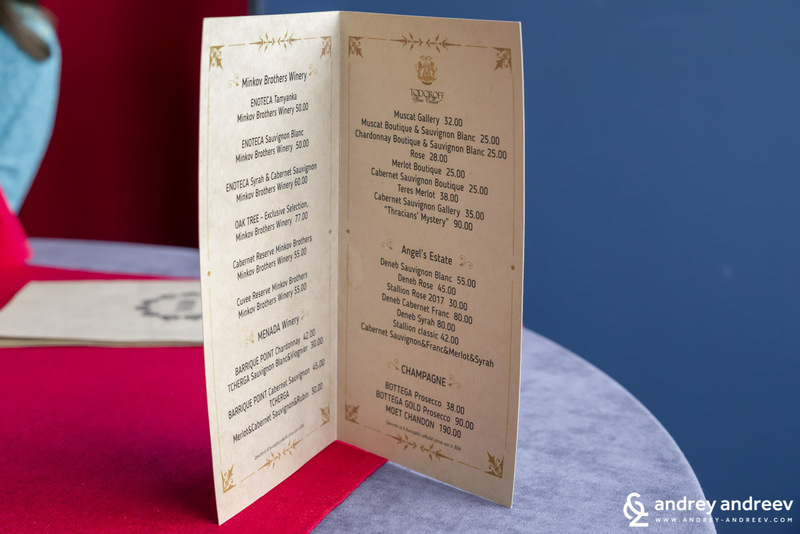 Generally, we expected a several-step menu, which, according to the little information about the restaurant we had, was promising to be gourmet-style. And because obviously everyone was in the mood to surprise us, we had no idea neither how many the courses will be, not what they will include. In the beginning they only agreed to reveal what wine it would go well with. 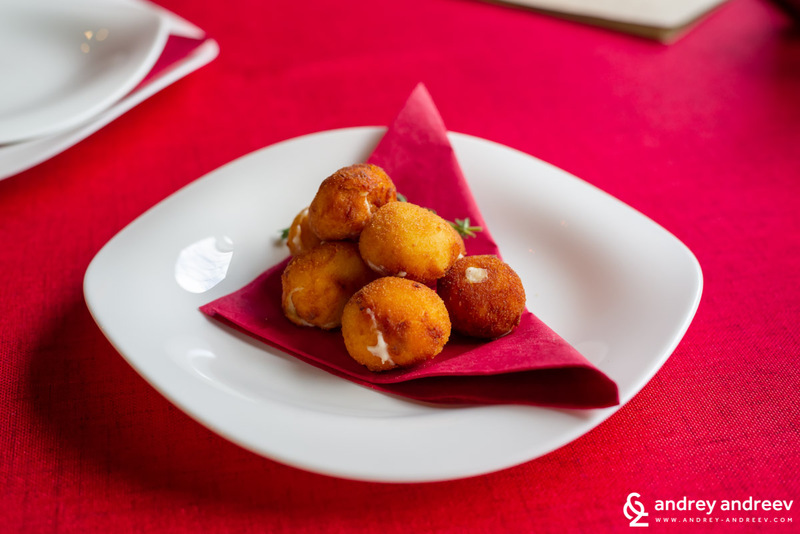 This was the starter – wonderful breaded balls with delicious filling, containing also chicken, bechamel sauce, shallot onion and nutmeg. It was a great company for the first sips of wine. Delicious bread with butter and herbs has always been something we are eager to grab. 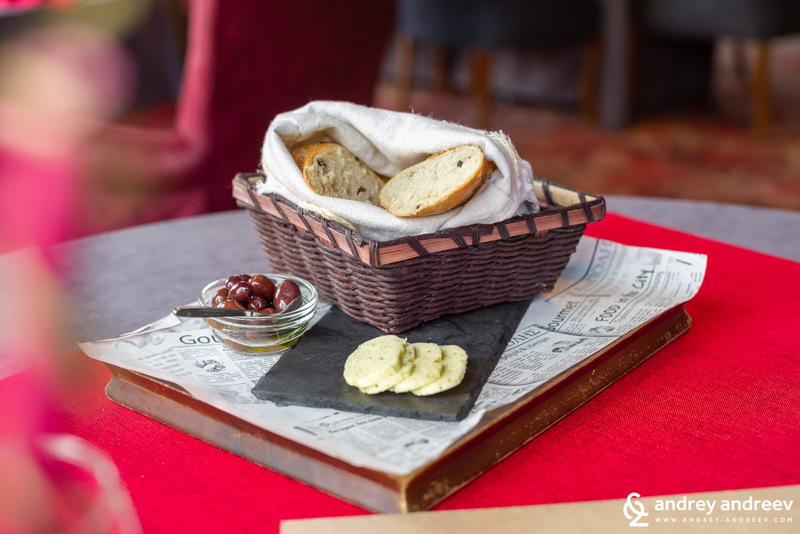 During one of our favourite trips – to Estonia – we were served incredible bread with butter every time we sit for a meal. Since then, we always appreciate the good bread. Let’s start with the idea that gazpacho is a tomato soup. Maria actually did not know that the strawberry gazpacho had tomatoes as well. Well, there were tomatoes. 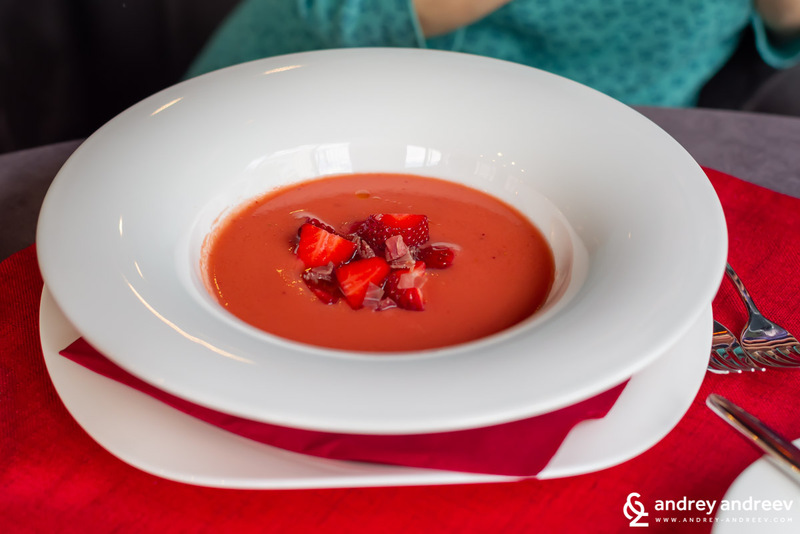 If you have not tried tomato soup with strawberries, now is the right moment for this, because the season of the strawberries is just now. It was a wonderful refreshing dish. This gazpacho was made with early strawberries, which are not so well-ripened and sweet but rather sour and juicy. In the soup we also find a final spicy note, due to the green pepper. The gazpacho was served with prosciutto which gave a perfect finish. About gazpacho, it is important to know that it is a cold dish and it would be a huge mistake if you return in for warming. Gazpacho is a wonderful Spanish soup that you must try when you have an opportunity. No gourmet tasting could go without foie gras. 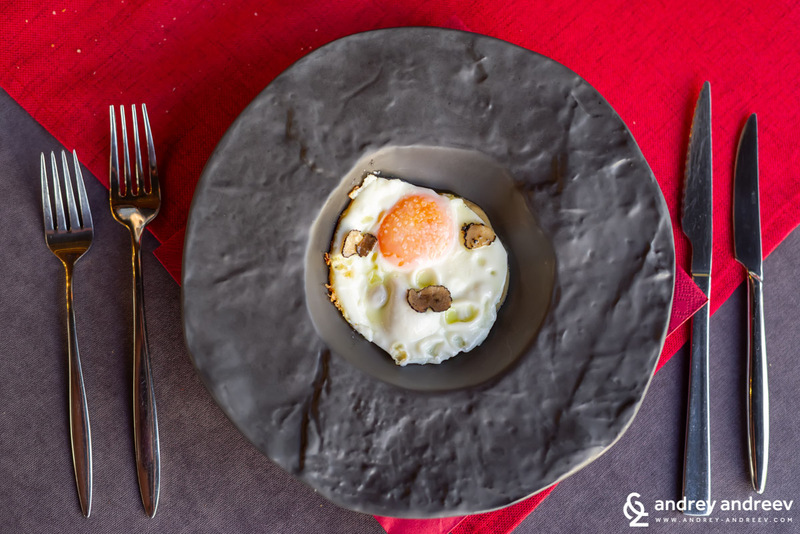 Every chef has his own method and mood for preparing this French delicacy from duck or goose liver. 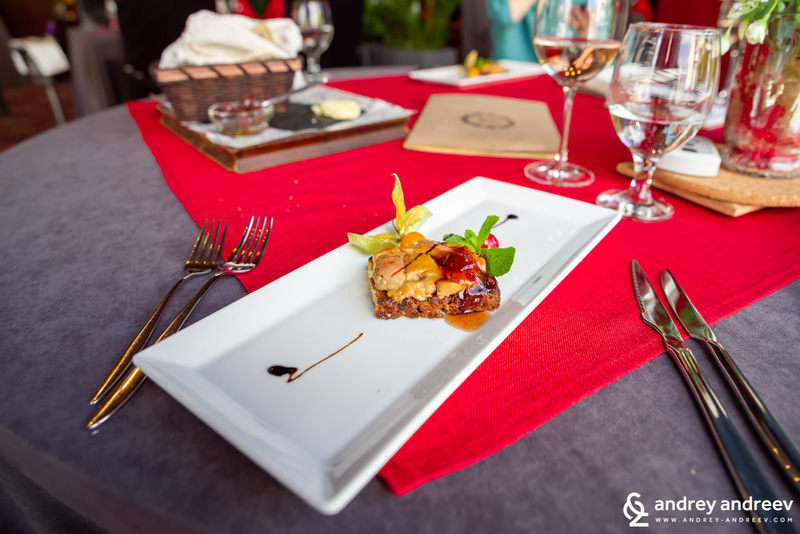 This time we were served smoked goose liver with rose jam, in a crispy bread. Garnished with physalis for beauty and freshness. 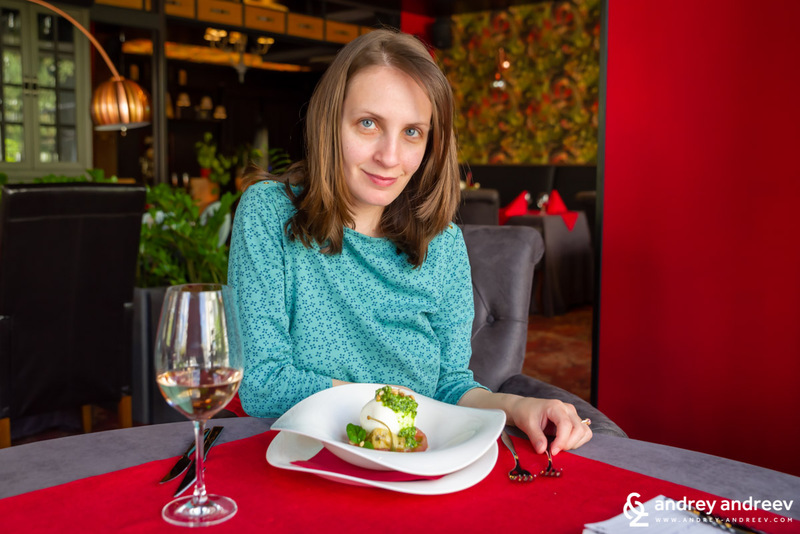 Now some off-topic – we first got to know physalis in the restaurant of Saka Manor in Estonia last year, despite the plant is not some exotic. Now let’s proceed with the gourmet lunch. Foie gras comes from my favourite French language that I studied in Stara Zagora many years ago. Literally, it means “fat liver”. A curious fact is that Bulgaria is second in the world in foie gras production, after France. Andrey was especially impressed by this foie gras because it felt really light and fresh. 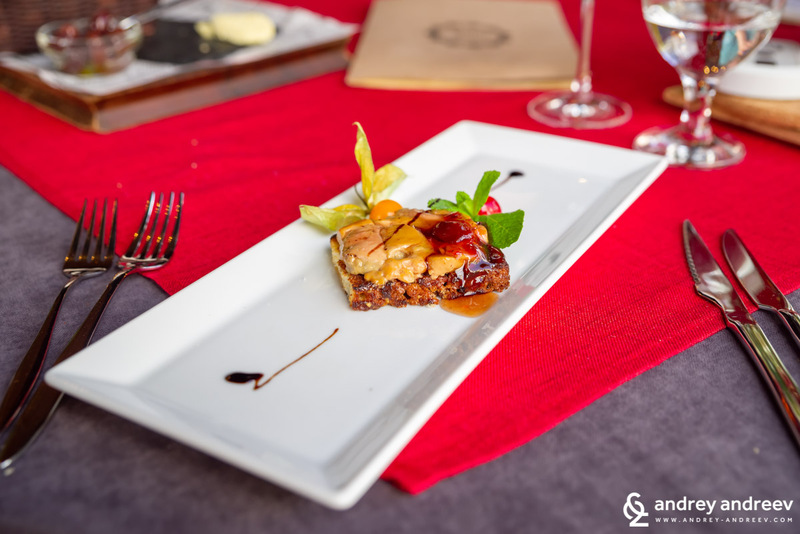 It is true that some variations of foise gras are not the lightest meal, because the main ingredients – liver and sweet, are naturally heavy. However, this time the foie gras was a very fresh spring dish, without too heavy sweet taste that might prevent you to feel other tastes after this. And the roses hinted of the region nearby which will be crowded with tourists in a month or two – the Rose Valley in Bulgaria. If you want to challenge Andrey, you should serve him offal. However, we know that in a good restaurant there is nothing we would refuse to taste. So this was the biggest challenge to Andrey this time. He is really sceptic about such delicacies and only in the recent years he agrees to taste something. Very often the experiment ends with the first bite. However, this time he ate everything and loved it. 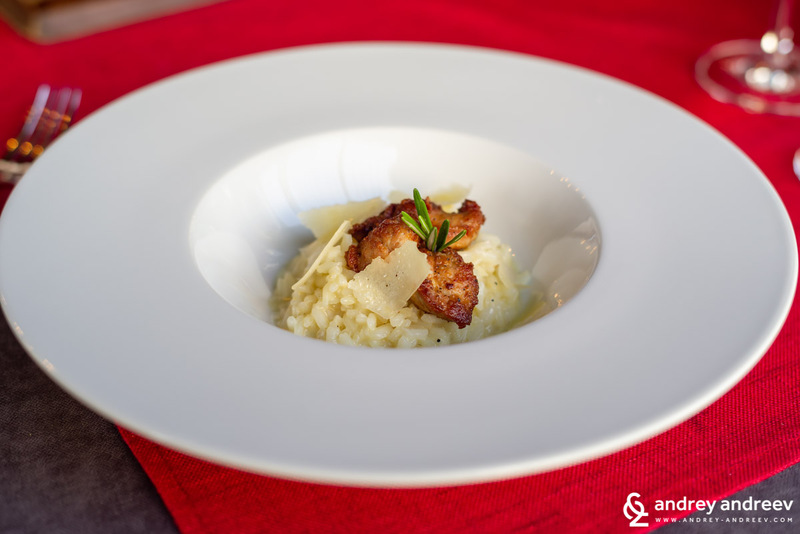 It was a wonderful creamy risotto with crispy sweetbreads. It was a very unexpected but wonderful surprise in the middle of the tasting lunch. The Caprese salad was a very refreshing moment. 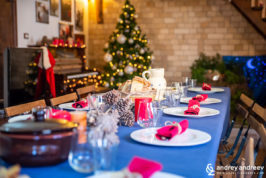 Generally, we have noticed that such multi-course meals usually go from the lightest to the heaviest dish and the salad usually appears in the beginning. So we did not expect a salad in this moment at all. However, we were more than happy about it. And despite is was not small, we had it all. This Caprese salad included a ball of buratta cheese with liquid center, tender pine nuts and some artichoke and capers for a more tingling taste. 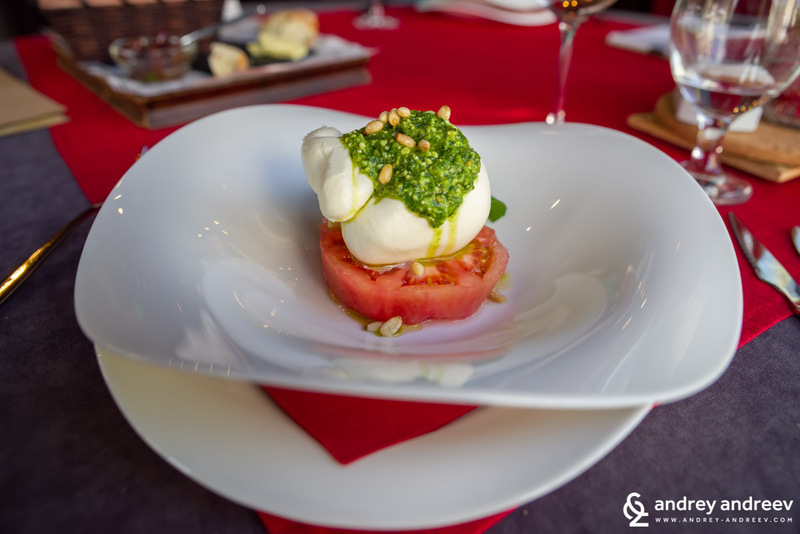 Burrata is a typical cheese from South Italy and many people mistake it for mozzarella, but they are different. In our stories about South Italy we are telling more about it. 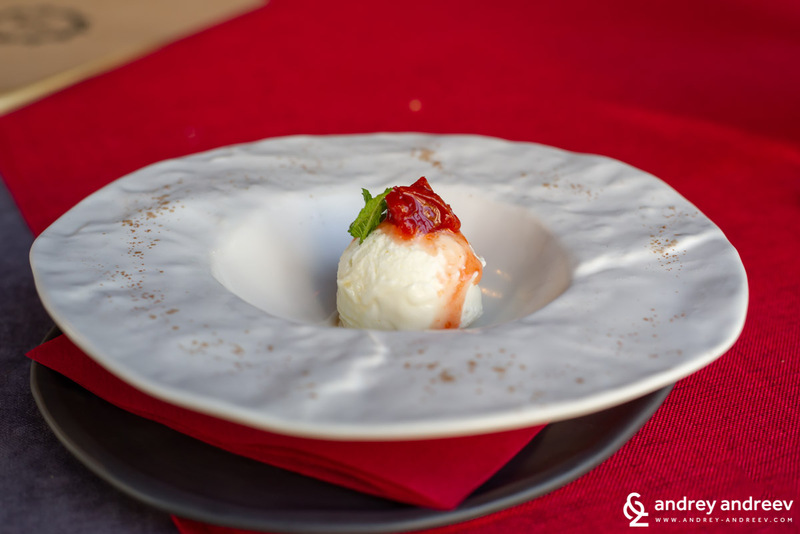 Burrata does not mature and is fresh white cheese with tender taste. After the salad a very serious question arised – how many dishes are left to taste. 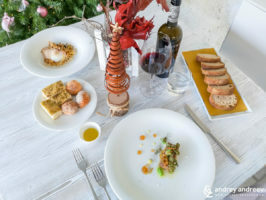 Because for us it was the sixth dish and we had previously heard something about fish and veal, so we already wondered whether we would be able to try everything. Moreover, we had been doing this for 2 and half hours already. It is amazing how such a simple and common product like egg can bring so much joy to a dish. Of course it can, when it is prepared by a professional with a lot of imagination and passion. 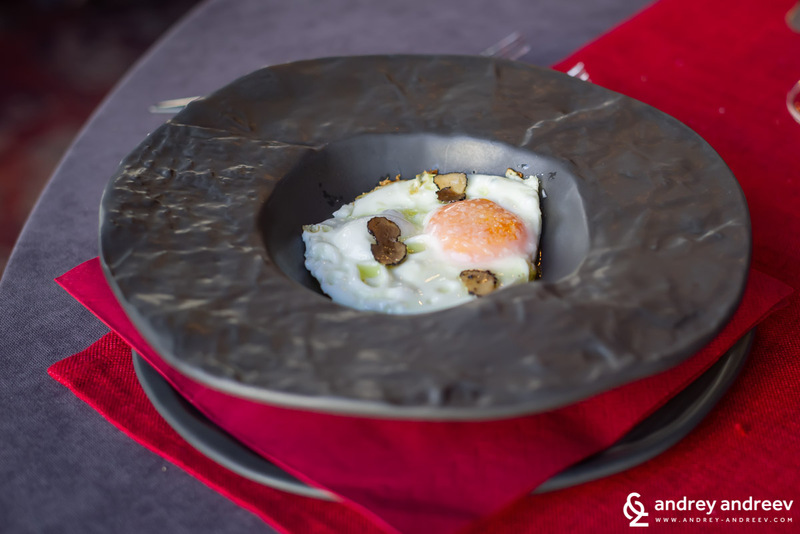 Our egg, which is also from free-range hens, was served on boletus mousse and baked with truffle flakes, which gave an amazing taste and aroma to the whole dish. Deliciously crispy on the outside and pink in the center, with wonderful sauces and light texture. Here we started to become short on comments – not because we did not like it, but because everything was so good that we could not find words to describe it. 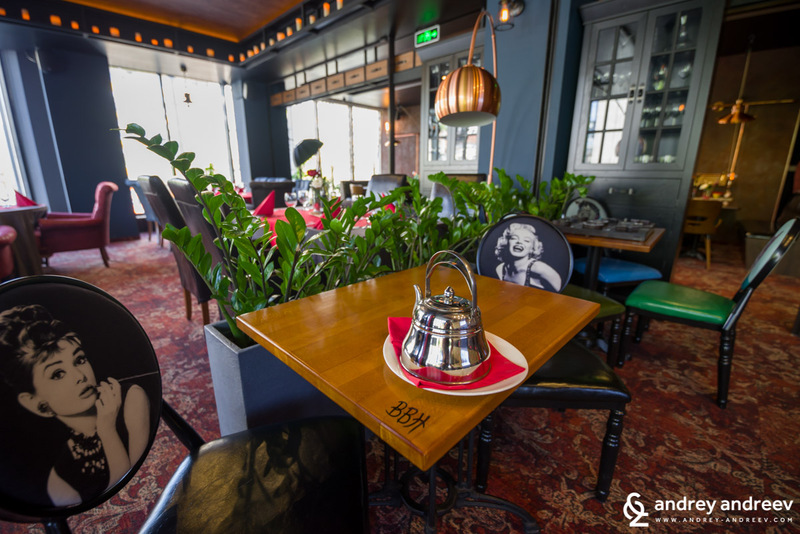 Some more things I know and would love to share about this place in Stara Zagora. The fish for the restaurant is delivered weekly from Greece. The other products are delivered daily. Veal is one of the foods that we more and more like in the recent years. However, it is a challenge to find good veal in the Bulgarian market to prepare at home. Restaurants are in the same situation so we dare to try veal only at places that look very promising, despite veal is served almost everywhere. The veal pieces were extremely delicate, juicy and light. Maria loved them and Andrey suggested that they could be a bit more spicier. Of course, this does not mean they weren’t perfect. Maria was wondering what spice there was in the ice cream because it was so aromatic. Well, it appeared that there were none. Obviously the good ice cream just tastes different from most of the ice creams on the market. It was a very refreshing finale with the quince jam. And we started to wait for the chef to greet him for the amazing lunch. 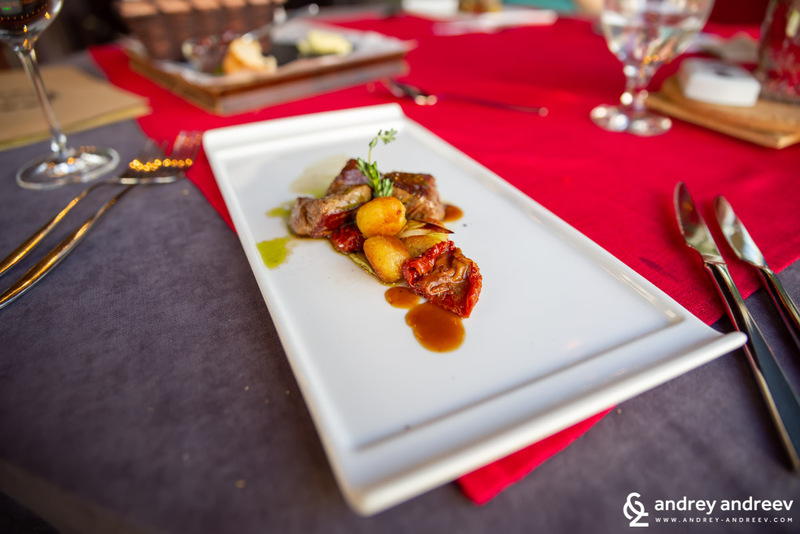 But first, to satisfy our curiousity who cooks such amazing things in Stara Zagora. The final surprise from the chef was this second dessert, served personally by him. Here Andrey started to like quinoa which usually he does not touch. And he managed to eat the whole dessert because Maria had no space for it. 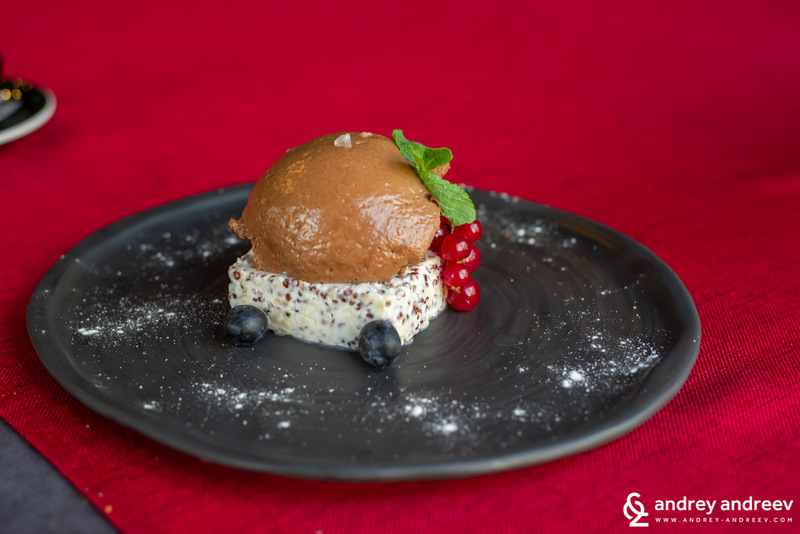 The most important thing is that we finally met the chef – Tsvetan Stoyanov, who proved to be one of these people that would be happy to go out of the kitchen, check the mood and tell you everything about the food and recipes they use. He told us that because of the marathon some of the deliveries were late and not everything was prepared by the initial plan. However, we did not notice anything improper. The good chef can always prepare amazing dishes even if the plan does not go as thought. So Tsvetan, who introduced himself as Tsetso, insisted that we finish our lunch with a cup of tea, server personally by him. And despite we had already ordered a delicious cup of coffee with hazelnut aroma, we trusted him and tried the tea after the coffee. 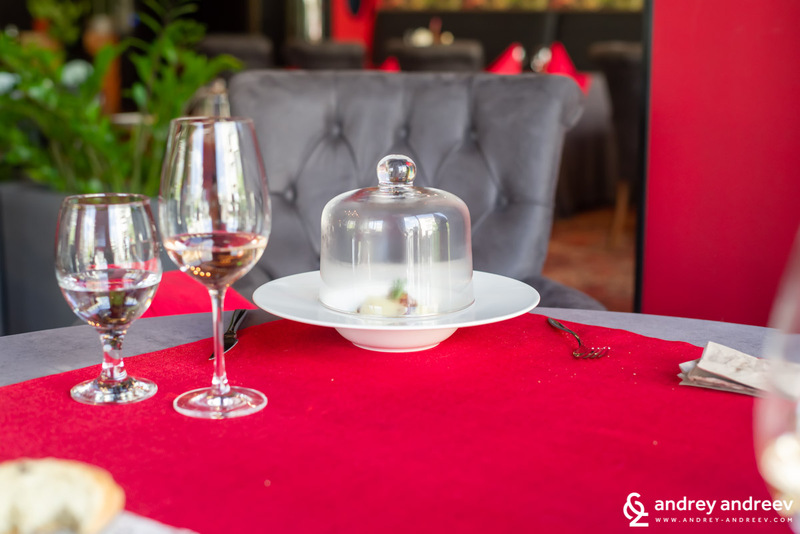 This was our refreshing finale of the tasting lunch in the probably the best restaurant in Stara Zagora currently. From all these words and photos you may have already figured out that this restaurant is probably not a place that you should visit daily and casually. Both the environment and the prices are more inviting for special occasions. It is really beautiful inside, the service is wonderful too, so we would love to spend our next good occasion there. Of course, it does not need to be an official holiday. We can make our own holidays and reasons to celebrate. Actually, each trip to Stara Zagora is one such occasion. 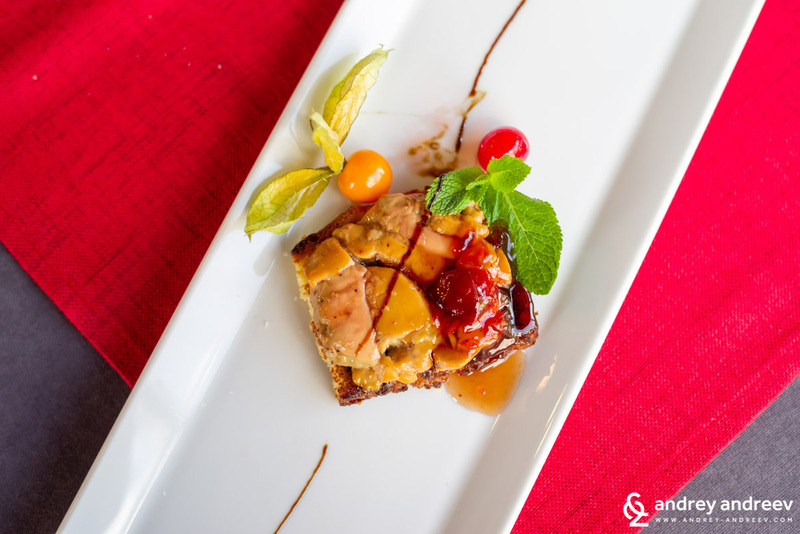 The menu might look extravagant from the first sight but we advise you to fully trust Tsvetan for the things he offers. 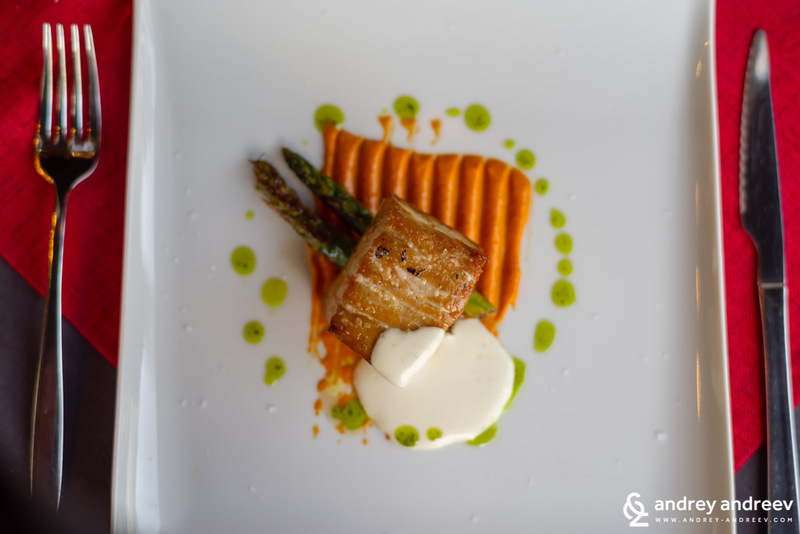 You can also book a tasting lunch like us, where you will leave yourself entirely in the hands of the chef, but will definitely be fascinated at the end. However, allow enough time for such an experience. It took us almost 4 hours. 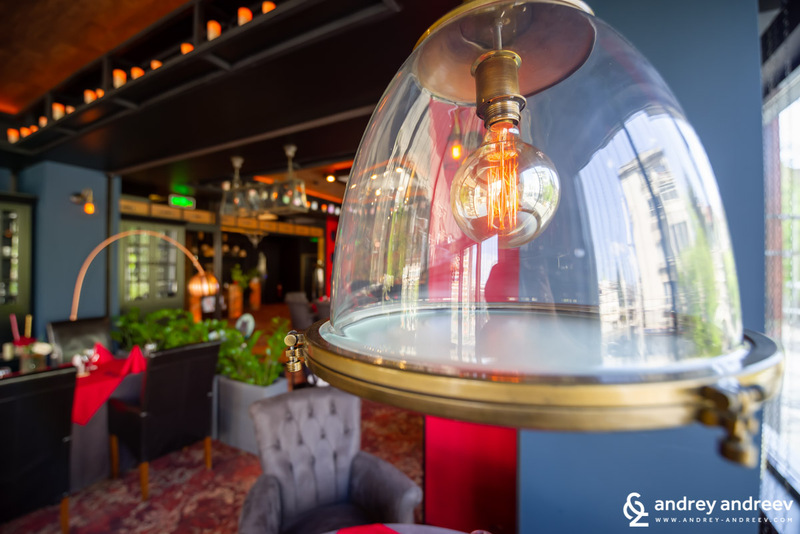 So if you are in Stara Zagora for an occasion or without such and want to try a different and special restaurant, they will be happy to welcome you at Best Boutique Hotel.